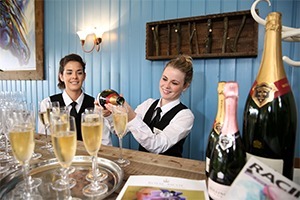 Eventmasters are thrilled to offer the finest Royal Ascot hospitality packages from the stunning Lawn Club from Tuesday 18th – Saturday 22nd June 2019. We are delighted to announce that in 2019 we will once again be providing official Royal Ascot corporate hospitality packages as an Official Hospitality Supplier (OHS) appointed by Ascot Racecourse. A delightfully fresh take on a track-facing facility, The Royal Ascot Lawn Club is a sumptuous marquee suite offering uninterrupted viewing of the racecourse from its elevated terrace, ensuring guests savour the pulsating action in style. Our Lawn Club Royal Ascot Hospitality Packages provide the idyllic setting for entertaining distinguished clientele with informal dining coupled with a viewing position just 300 metres away from the iconic winning line. The Lawn Club is, without doubt, one of our most popular Ascot hospitality packages for 2019. The Lawn Club – synonymous with style, elegance and tranquillity – is a track-facing marquee that provides guests with uninterrupted views across the course from an elevated decked terrace. Attendants are cordially greeted with an exquisite Prosecco Jeio reception before indulging in a sumptuous four course buffet lunch and all-day complimentary bar. Situated right at the heart of the trackside excitement and just 300 metres from the winning line, The Lawn Club undoubtedly allows guests to not only savour the finest in hospitality but also experience the pomp and pageantry of Royal Ascot in a delightfully intimate setting. The Lawn Club is a superb hospitality location offering outstanding track-side views of the captivating racing action. I cannot fault anything about the day. We enjoyed a superb racing spectacle and the finest hospitality service to boot; I would recommend it to anyone. Royal Ascot is without doubt an occasion not to miss. Having now been twice, I still cannot resist going back again, there is far too much to enjoy throughout the day.